Kickers, Punters, and Long Snappers have the opportunity to chart their performance during any national or international event to improve their individual ranking! This includes instructional camps, showcases, competitions, private instruction sessions and lessons. This is a great opportunity to record your best scores, improve your state, regional, and national ranking... and get ahead of the competition! 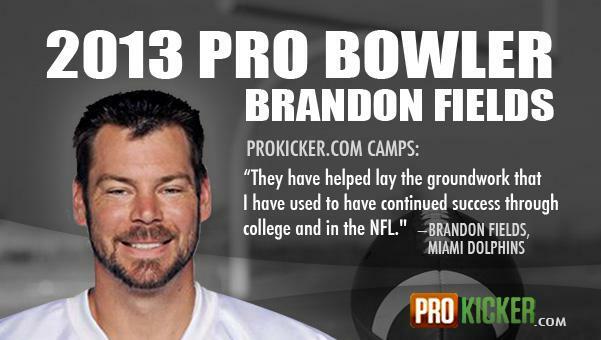 Private kicking lessons / kicking instruction and private long snapping lessons / long snapping instruction sessions are scheduled in one and two hour segments on a first come, first served basis. Please link through to our locations and schedules to find a kicking, punting, and long snapping instuction site nearest you. To reserve your slot just contact our office (606)922-8482 today! 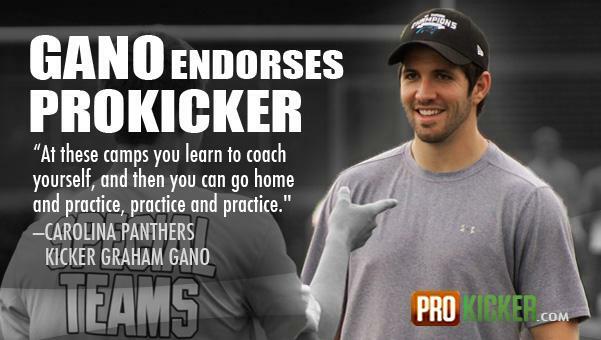 The Ray Guy | Prokicker.com Kicking Academy and Kicking Camps are the most comprehensive instructional camps in American Football. These camps truly provide a national and international competitive platform for kickers, punters, and long snappers to develop their skills and earn recognition from college coaches for recruitment. The strategic placement of training camps in every major United States geographical region provides kickers, punters, and long snappers the opportunity to compete with athletes from anywhere in the world for walk-on recruitment and scholarship opportunities. Regardless of level of competition, athletes who are eligible have a timely advantage to learn and compete on an “equal playing field” throughout the entire winter, spring and summer months! Earning a scholarship in today’s highly competitive recruiting market it is extremely challenging - especially right out of high school. It’s actually considered to be quite an honor to even be recruited as a walk-on. Athletes simply need an innovative way to distinguish themselves, promote their ability, and be found by the college recruiters. There are over 15,000 high school football teams in the US (along with a growing number of eligible international athletes) compared to only a few hundred colleges that even offer football scholarships. And even fewer programs that truly have a need for a kicker, punter, or long snapper in a given year. 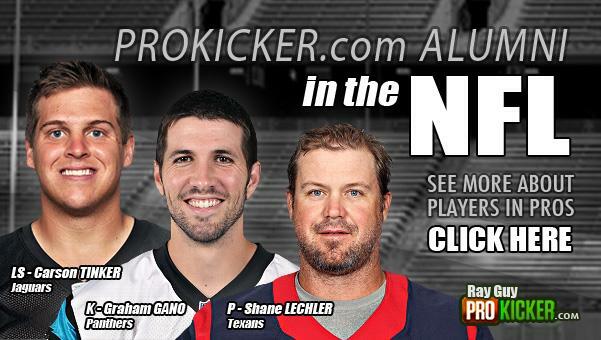 The Ray Guy | Prokicker.com Academy annually provides over 50 training locations in cities all across the United States allowing more athletes an opportunity to develop their individual technique and promote their athletic skills. This instructional format does more than maximize participation on the national and international level; it enables a true measure of talent by canvassing talent worldwide and identifying the most credible prospects in football. Individual performances will simply gain more attention and prestige by truly competing with the finest athletes competing in American Football. At every training site each athlete receives one-on-one attention allowing him to develop his very own personal style. Throughout the entire instructional process athletes are continually evaluated and charted to enhance skill development as well as to establish individual progress. At the conclusion of each camp session or training event the most recent statistical information is entered into an innovative database which identifies the rankings for that scheduled day and also updates the national rankings. This allows immediate internet access to a listing of the top ranked players at their position level and the most current information available on their performance capabilities. This same process allows the rankings to evolve chronologically throughout the entire camp season by continually elevating the best performers to the top of the state, regional, and national ranking list. The national competition culminates at the conclusion of the last instructional session of the summer. The final national and international ranking by position is then determined as well as the introduction of the most comprehensive football recruiting list of its kind! At anytime throughout the entire camp season athletes can take advantage of the ranking process by participating at multiple locations to “raise the bar” and improve their ranked position. Once scores are recorded and displayed they can only go up. This simply means only their best performance will be ranked. This will provide each player the opportunity to continually develop their skills, enable them to perform at the most optimum level, and at the same time produce the most current information available on their performance capabilities. 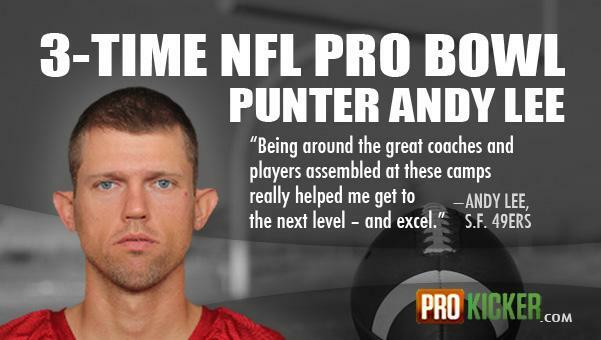 Kickers, Punters, and Long Snappers have the opportunity to chart their performance during any event including private instruction sessions and lessons and improve their individual ranking! This is a great opportunity to record your best scores, improve your state, regional, and national ranking... and get ahead of the competition! Private kicking lessons / kicking instruction and private long snapping lessons / long snapping instruction sessions are scheduled in one and two hour segments on a first come, first served basis. Please link through to our locations and schedules to find a kicking, punting, and long snapping instuction site nearest you. To reserve your slot just contact our office (606) 922.8482 today! Note: You must have adobe Acrobat Reader to view the above brochures.